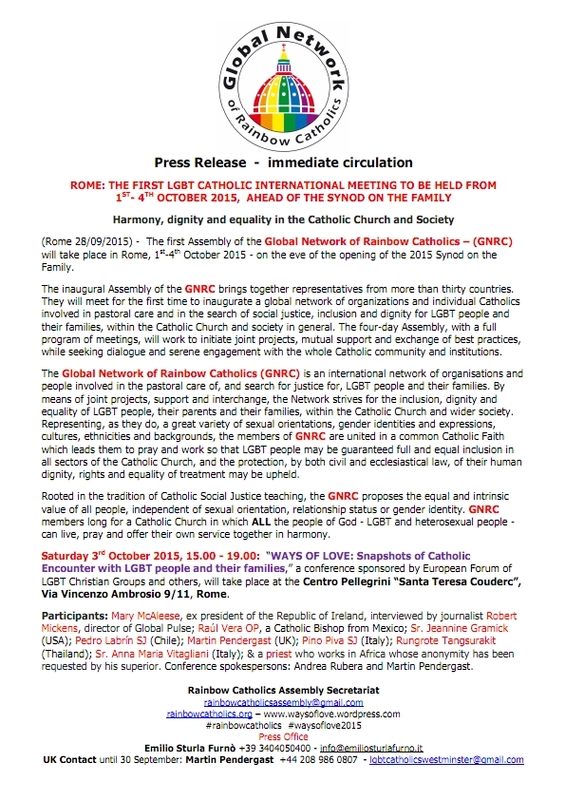 The first Assembly of the Global Network of Rainbow Catholics – (GNRC) will take place in Rome, 1 st-4th October 2015 - on the eve of the opening of the 2015 Synod on the Family. 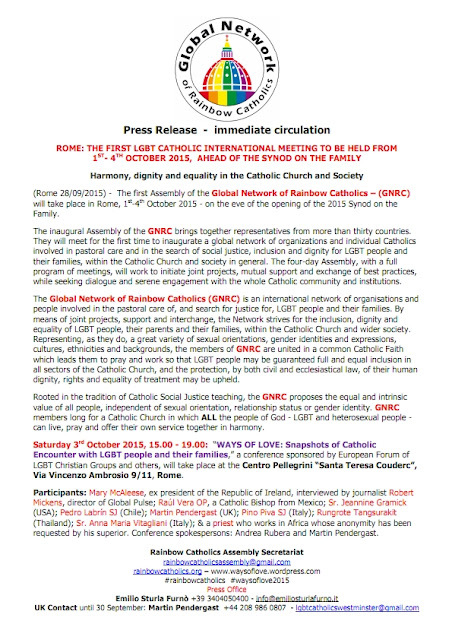 The inaugural Assembly of the GNRC brings together representatives from more than thirty countries. 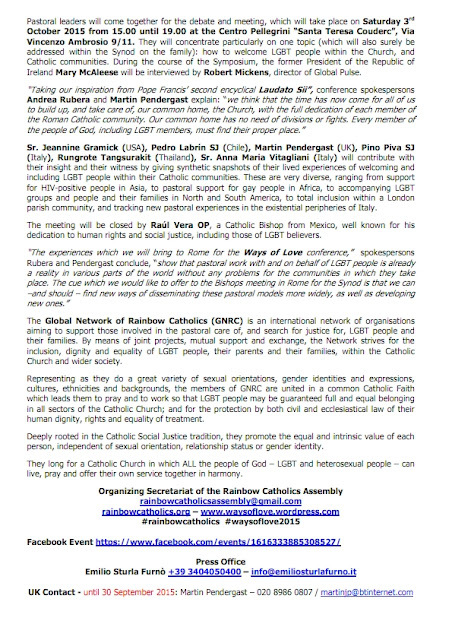 They will meet for the first time to inaugurate a global network of organizations and individual Catholics involved in pastoral care and in the search of social justice, inclusion and dignity for LGBT people and their families, within the Catholic Church and society in general. The four-day Assembly, with a full program of meetings, will work to initiate joint projects, mutual support and exchange of best practices, while seeking dialogue and serene engagement with the whole Catholic community and institutions. 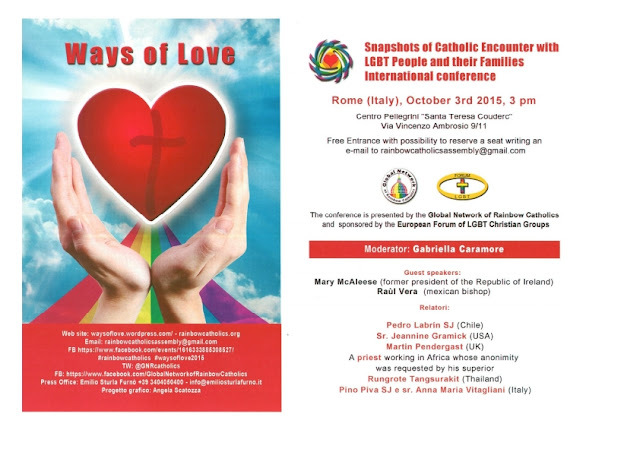 On Saturday, 3 October there will be a Conference entitled: Ways of Love: Snapshots of Catholic Encounters with LGBT people and their families. The key speakers will be H. E. Mary McAleese, former President of the Republic of Ireland, world-renowned theologian Sr Jeanine Gramick and Bishop Raul Vera OP of Mexico. 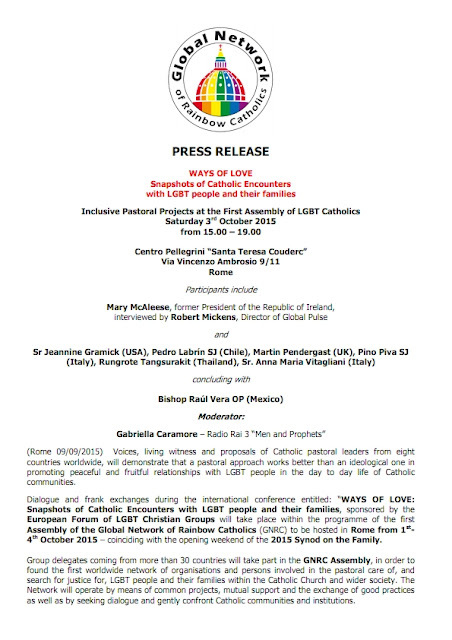 Drachma, which is one of the founding members of the GNRC will be represented by four members, two LGBTI members and two parents of LGBTI persons. Postal Address: Drachma, c/o 91, Ta' Lieni, Raymond Caruana Street, Gudja, GDJ 1011. COPYRIGHT © DRACHMA. Awesome Inc. theme. Theme images by -ASI-. Powered by Blogger.